James was born about 1813 in Tennessee. He was the son of Elisha Nelson and Sarah Elizabeth Henry. 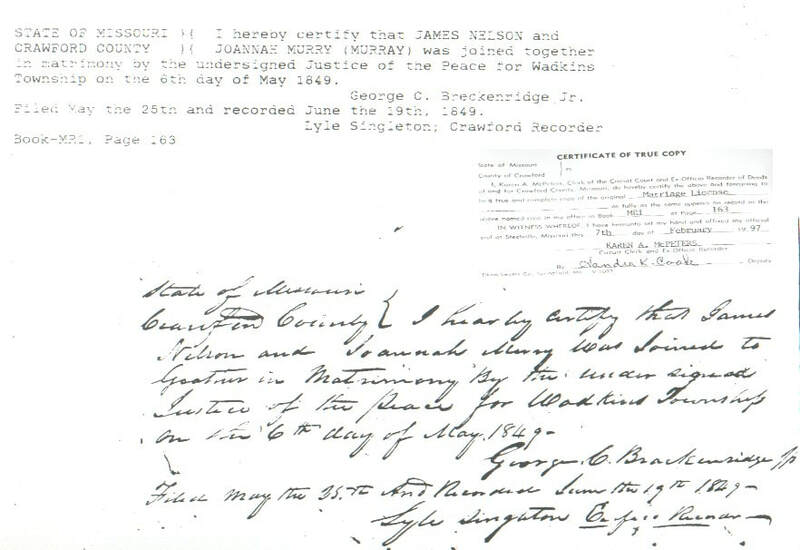 James married Johanna Murray on May 06, 1849 in Crawford County, Missouri. They were married by George C. Brackenridge, JP. Johanna was born on March 1828. She was the daughter of John A. Murray and Holly Earp of Nash, North Carolina. The 1840 and 1850 Census records show James and Johanna living in Crawford, Missouri. The 1860 census which was enumerated on July 7, 1860 shows Johanna Murray, widow of James Nelson, living in Merrimac, Dent County, Missouri. Living with her was Andrew J, age 17, son; William C, age 10, son; G.W., age 8, son; Moses M, age 6, son; and Thomas R., age 3, son. Her neighbors were Elisha and Elizabeth Nelson. James died in 1859 in Missouri. After James’ death, Johanna married James Swafford on March 4, 1861 in Dent County, Missouri. Johanna died in 1909 in Arkansas.